JBL Reflect Aware review | What Hi-Fi? 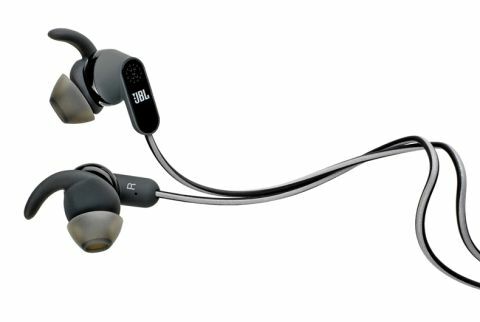 While many Lightning headphones use the new connection as their headline feature, on the JBL Reflect Aware earphones, that connector comes way down their list of talents. These versatile in-ears are primarily aimed at a fitness market, offering a sweatproof design and eartips that are designed to fix them tightly to your ears. They don’t have to just be used when working out of course. The JBL Awares have active noise-cancelling (ANC) on board and you can adjust the level of background noise you want to block out, which is handy for when keeping one ear tuned into your surroundings isn’t a bad idea. With the Lightning connector, they take the power for the ANC from the phone, so there’s no need for any bulky battery pack. The downside of course, is that they drain your phone’s battery quicker with the noise cancelling turned on. We don’t notice a huge difference when playing music stored on our phone though. It takes 45 minutes to drop 5 per cent with ANC on at just over half volume, and about an hour with ANC off. It’s a case of picking your noise cancelling moments carefully if you want to conserve your battery. We prefer the sound of the JBL Reflect Aware with the ANC turned off – it’s a more lively and cohesive sound – and the noise cancelling isn’t hugely convincing either. It will take the edge off an airplane hum or the rumble of a bus engine, but you’re still likely to hear a lot of what’s going on around you, even with the ambient awareness switched off. Switch it on (you can choose from low, medium or high, and each ear can be adjusted individually) and it seems to just let in the higher frequencies of your surroundings, that’ll allow you to have a conversation with colleagues or make you aware of nearby traffic when you’re running. It has a weird effect on the noise of a busy office though, and not one we’d keep turned on for the best sound quality. With the ANC average at best, if you need to keep your ear on your environment, we’d just turn it off. When you plug the JBL Reflect Aware into your phone for the first time, you’ll be prompted to download an app, which allows you to control all these things, plus tweak the EQ. There are a number of presets or a ten-band equaliser for you to adjust to your liking, though just turning noise cancelling on or off can be done via the inline remote. They come with three different sized buds, plus a choice of extra attachments that rest against your ear to keep them in place. At first glance they look bulky, but choose the right fit for your ears and they do a good job of staying put, and are comfortable too. They’re a confident, largely well-balanced listen that don’t focus on any part of the frequency range. The midrange is solid and insightful, offering enough clarity to dig out detail from voices and nuance in instruments, and the bass is tight and controlled, offering plenty of weight without overpowering. They sound big too, and spacious for a pair of in-ears, though the treble could do with a little refinement, as it sounds a touch forward on occasion. How noticeable that is depends on the music you’re listening to. With a lot of pop and R’n’B it’s just enough to give a track bite and excitement, but with rock and electronic music, it can tip the scales into sounding a little harsh. We’d recommend giving the Aware in-ears a run-in of at least 24 hours to mellow them out. They time well though, and offer a fun and engaging sound that’ll grab you at first listen. While they attack a fast-paced tune with kick and enthusiasm, they don’t throw everything at you in a wall of sound. They are talented at delivering subtle detail and lower-level dynamics, following both tempo and volume changes with agility and precision, but they don’t go particularly loud. We push them towards top volume before we get a really powerful sound, which will have an effect on your battery. At £170, these aren’t a cheap pair of headphones, but they do offer plenty of bang for your buck. Sporty types will find these particularly appealing thanks to the secure fit and water resistance, and though the on-board noise cancelling isn’t outstanding, it does enough to put it on par with other in-ears we’ve heard. Most of all though, these in-ears deliver in the sound department. We like their lively, insightful sound and though that treble can be a touch troublesome on occasion, it’s made up for by their clarity, control and insight elsewhere. If you’re an iPhone 7 user that prefers in-ears to over-ears, the JBL Reflect Aware is a talented pair of earphones worthy of serious consideration.